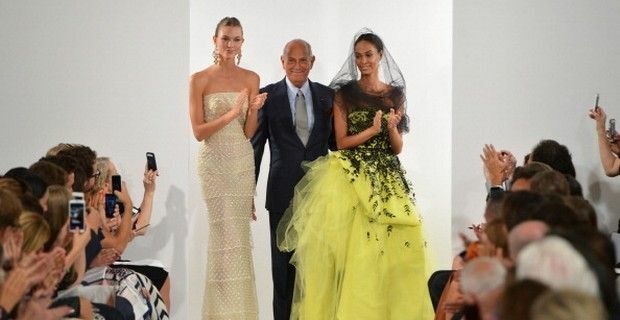 For his 2014 Spring and Summer collection presented at the New York Fashion Week, Oscar de la Renta featured ensembles reminiscent of the ‘50s and the Elizabethan era. It is easy to love Oscar de la Renta’s designs, because of their stunning elegance and class, and flattering long-line silhouettes. On the New York runway Oscar de la Renta presented his 2014 Spring and Summer collection in sort of chapters, starting first off with small checkered black and white prints. These gingham style prints were on skirts, tops, and on the lapels and wrists of beautiful kimono style jacket/coats, designs seen last year, but re-modernized for the upcoming 2014 Spring season. They were either de-structured or more form fitting, and worn with a waist cinching belt. The black and white checks also made their way on dresses with the same print peeking out from beneath the frocks and on the lining. Brocaded style fabrics were also present on a coat and dress, and for a more lighter and summery look there was a large use of white, ivory and lace. Full-skirted dresses with colorful printed flowers in blue, green, and bright coral, over black-and-white polka dots, followed by ‘50s styled cocktail dresses with stiff skirts in solid colors and also in happy floral patterns. Next up were billowing evening gowns in tulle and taffeta, with an abundance of naked shoulders and nary a shoulder strap in sight. Model Joan Smalls probably had the honor of wearing one of the most stunning gowns of the collection. In yellow silk and tulle with black filigree thread work and sequin embroidery, which was topped off with a romantic veil in black tulle.